Get the best prices on Buffalo Bills hotels from WorldsBestDeals.com. This is your source for hotels near the Buffalo Bills football Ralph Wilson stadium as well as car rentals, flights, local weather and guaranteed low hotel rates. 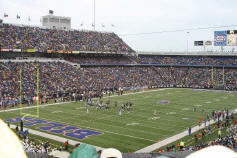 For more Buffalo, New York hotel options click here, or use the form below for the next Bills football game. Take 90 West to Exit 55 (Route 219). Exit 219 on Milestrip Road West Exit. Be prepared to stop at the end of the ramp. Counting the signal at the end of the Milestrip ramp, go to the 3rd signal and make a left turn onto Abbott Road to the Stadium. Take 90 East to Exit 57, and bear right heading west from tollbooth to Route 20. Make a right on 20 heading East to the Stadium. -OR- Take 90 East to Exit 56 (Route 179) Milestrip Road. Make a left on 179, and including the signal after the toll, proceed to the 5th signal and make a right turn onto Abbott Road. Follow Abbott south to the stadium. Take Route 219 North to exit 20A West. Follow 20A to the Stadium approximately 1 mile west. Head straight out of airport and proceed through light toward Route 33 West, which will lead you to the New York State Thruway (Route 90). Take 90 West to Exit 55 (Route 219). Exit 219 on Milestrip Road West Exit. Be prepared to stop at the end of the ramp. Counting the signal at the end of the Milestrip ramp, go to the 3rd signal and make a left turn onto Abbott Road to the Stadium.